The winner of the 4th Annual Writivism Short Story Prize has just been announced at a ceremony held in Kampala, Uganda. The announcement crowns the end of yet another Writivism festival. The List by Joseph Aito is an entertaining story that examines a love affair through the items on a list. The writer has an exceptional way with words, making the protagonist both hilarious and appealing despite his stubborn conservatism and tribalism while ensuring that the female character does not become trapped in customs but ends up deciding for herself. Boyi by Gloria Mwanage Minage was loved by the judges for its simplicity. Sometimes tragically, sometimes dramatically, Boyi engages the emotions throughout a story of the recruitment of a young man into an armed struggle. The author successfully engages a complex subject with through the innocent narrative voice of a child to carry the reader from episode to episode. On the Swahilification of Mutembei by Abu Amirah, the judges had this to say: “Skillfully using a humorous and original construction, this story interrogates identities by asking the question who is a “muSwahili”, or, more simply, who is an African today? The author masterfully navigates back and forth through this exploration in the setting of a game of drafts. 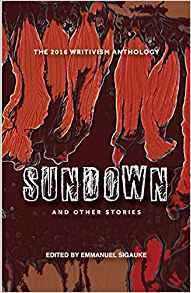 The judges are happy to announce that Sundown is the winner of the 2016 Writivism Short Story Prize.